Women have been racing and driving fast since the invention of the combustion engine. Intrepid ladies such as Camille de Gast who, in 1903, became the first woman racing driver, and before her Bertha Benz, the wife of Karl Benz (of Mercedes Benz), who in 1888, was the first woman to drive a motor vehicle solo and who used her garter to ignite an electrical spark. And what about the Englishwoman Dorothy Levitt who broke the women’s speed record in 1906, reaching 91mph in her ninety horsepower six cylinder Napier? My absolute favourite is Mrs Victor Bruce, the first women to be prosecuted for speeding on her brother’s motorbike and in 1927, drove non-stop from John O’Groats to Monaco for the Monte Carlo Rally, winning the coup de dames. They personified a new type of liberated women, ‘scorchers’, as they were called, who lived for freedom and speed. These women were practical too. Miss Levitt advised her fellow Motoristas to ‘carry a little hand-mirror in a convenient place when driving’ so one could ‘not only put one’s lipstick’ but to ‘hold it aloft from time to time in order to see behind while driving in traffic.’ Thus the rear-view mirror was born (though not introduced as standard for another five years). 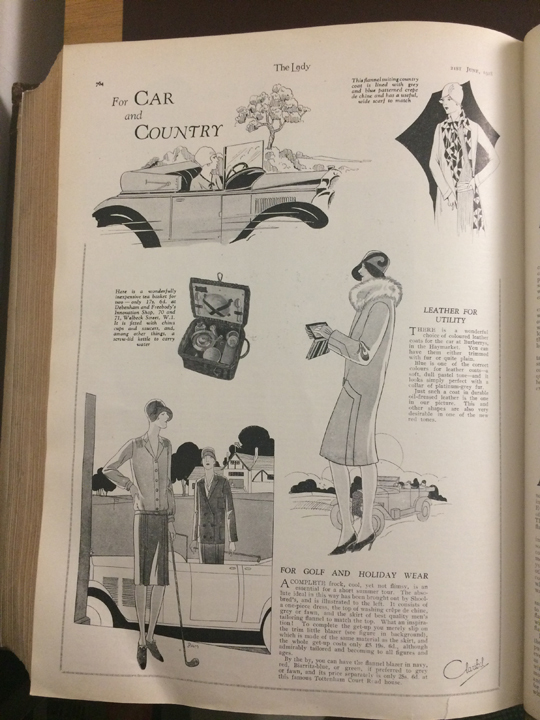 The Lady magazine in the twenties captured this new adventurous type of woman with a column entitled The Lady and Her Car, a regular monthly column with the occasional article mentioning speed however, the main agenda was how to maintain one’s car and what to look for with Insurance and road management that constituted for a good read. In this series we look back at The Lady archives and investigate these historical articles whilst comparing them to how women look after their cars and generally at motoring today. Currently driving a car is considered to be the norm whilst maintaining a car is not, the engines are computerised with even the oil filler disguised amongst the array of black plastic coverings inside the bonnet. Our clothing is occasion or age appropriate and our enjoyment of driving a car is usually dependent upon how we can best avoid a traffic jam. Very different to the 1920’s. 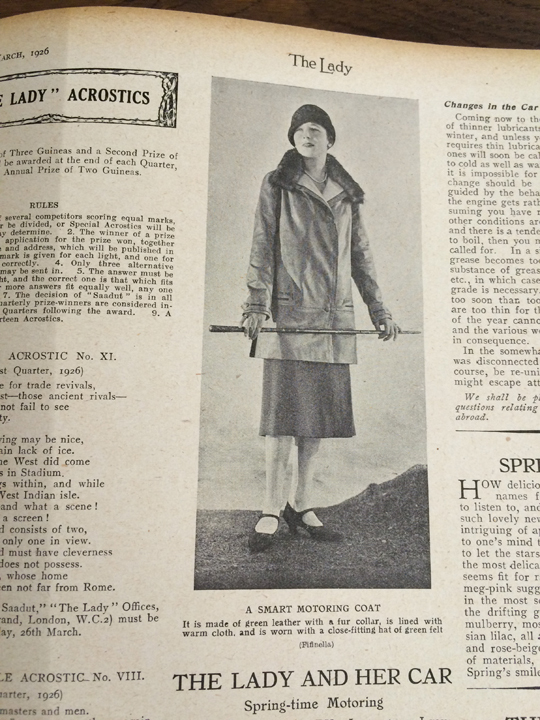 In the 1920’s clothing was weather and motor specific, such as springtime in 1926 The Lady discusses a smart springtime coat, of green leather and a fur collar lined with a warm cloth. Warn with a close fitting hat of green felt. The column goes on to reiterate that whilst it might be sunny when you get in the car, the weather can change and become over cast on route. This wonderfully shows that the cars were either open top or with a canvas hood, without a complicated heating system, and that journeys would have taken longer than we expect today. Of course winter gloves may be put away for the spring… Today, does one wear gloves at all? Also rugs may not be put away just yet, can be folded and placed in the car – can you imagine the discomfort of feeling a chill on such a fresh spring morning? Again, clearly sharing the idea that directed heating had not quite yet been perfected in the motorcar. We simply splat on the heater now to 3 bars and point it at our feet. © 2019 · GearStick & ClutchBag. All rights reserved.